UMBC may be nestled in the small town of Catonsville, but over the years the university has become a crossroads of international research, civic engagement, and a welcome center to anyone pursuing the life of a global citizen. But, what makes UMBC such an international campus? The famous flags in The Commons? The answer is much deeper than that. It’s a commitment to envisioning an inclusive path dependent on intercultural collaboration that has created a thriving world of possibilities through which to engage in all the world has to offer. UMBC’s windows-to-the-world philosophy has caught the attention of some big names recently. 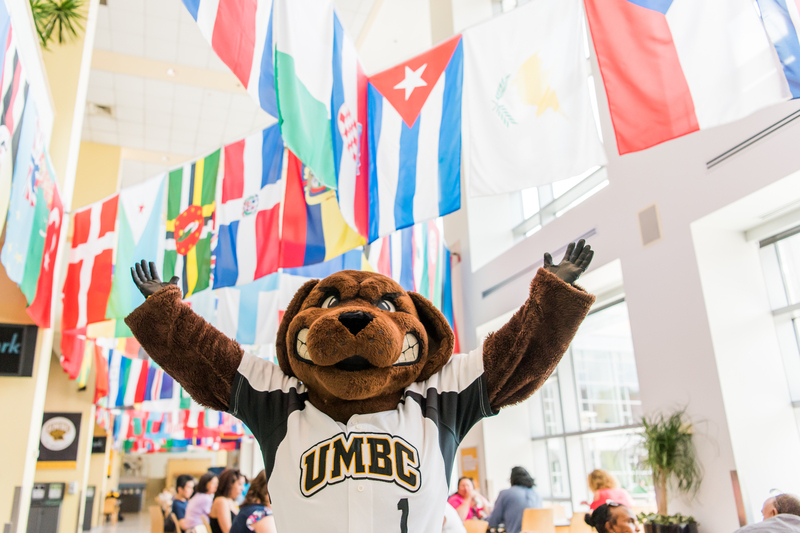 Times Higher Education recognized UMBC as one of the world’s top young universities, and The Center for World University Rankings recognized us as one of the top 3.5 percent of all universities worldwide. Most recently, the Professionals in International Education (PIE) included UMBC as the only U.S. finalist for a 2018 PIEoneer Award, in the Student Support category. Accolades aside, one thing is for sure — if you start at UMBC, you can go anywhere because you will have all the support that you need. So, feel free to move around the world. UMBC’s visual connection to the world begins where visitors first set foot on campus: on the bricks of the Administration Building drop off circle. There, hellos in dozens of languages — from “Witamy” in Polish to 欢迎 in Mandarin — make it clear that all are welcome. Walking down Academic Row, you can hear what a global campus sounds like — from President Hrabowski practicing his French with faculty from the Caribbean, to students and faculty sharing conversations in English, Korean, Hindi, Hebrew, Urdu, Spanish, Igbo, and Italian, just to name a few. Students share their talents at PANGEA, an annual cultural showcase. International pride is most evident in The Commons, where 156 flags hang to represent the countries our students come from; it is also the home of 26 cultural and ethnic student organizations. Over the last decade around 1,000 international students have made UMBC their home, both for short- and long-term study. Students at UMBC take pride in their cultures, languages, and traditions — and love sharing them with the campus community. 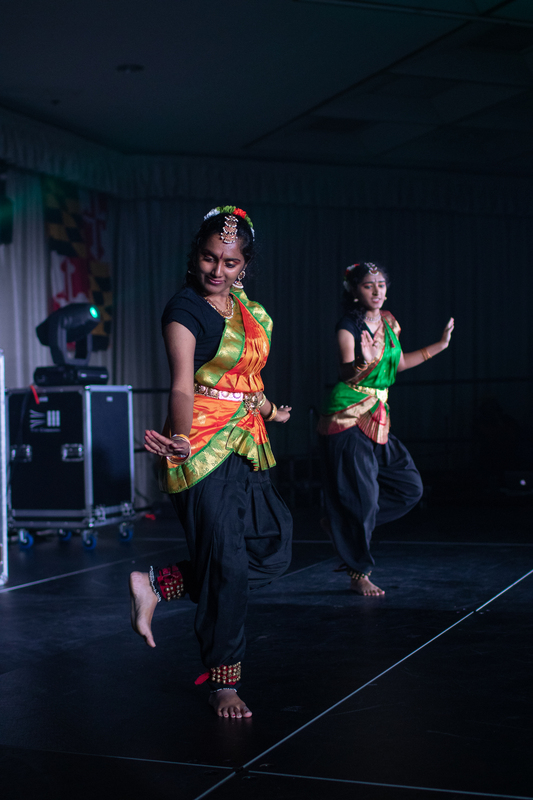 One popular annual event, PANGEA, is a cultural showcase celebration organized by the student-led UMBC Cultural Showcase Board during Welcome Week. The event centers on sharing food, dance, and traditions important to the cultural and ethnic groups on campus as a way of welcoming students and encouraging all to get involved. Many students swim, run, bat, or kick their way through college. At UMBC, international athletes are an important part of the athletic culture, sharing their world-class skills in a welcoming environment while preparing for the next level of their athletic career. For some that means Olympic level. Mohamed Hussein ’14, mechanical engineering, M.S. ’16, engineering management, represented UMBC in swimming and diving for three seasons and was part of the Egyptian swim team in the 2016 Olympics. Cleopatra Borel ’02, interdisciplinary studies, was an NCAA women’s shot put champion and has participated in four Olympic games as a member of the Trinidad and Tobago track and field team. This year there are 375 student athletes on campus, and nearly 10% are international athletes. “I thought it was impossible to find a home away from Cairo, but the support I get from my teammates and my [swimming] coach, Chad Cradock ’97, gives me so much energy and power to be my best self in the pool and in real life, too,” says Hania Moro ’19, financial economics, who holds an Egyptian National Record in the 400 free, and last year came in first place for the Retrievers in the 500 and 1650 free. 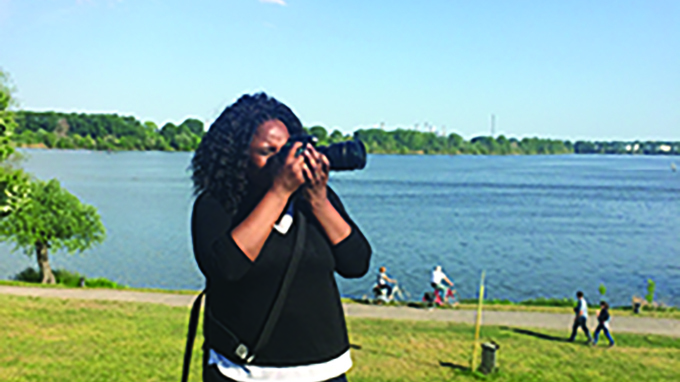 LEARNING TO LISTEN: As a travel photographer and writer for National Geographic, BBC, and Lonely Planet, among others, Lola Akinmade Akerstrom ’98, M.S. ’02, information systems, learns from every new job she takes and every new person she meets. But, coming to America from Nigeria to study at UMBC taught her invaluable skills that deeply changed the way she looks at the world. Read Lola’s full story. Cultural and social engagements are just the beginning of UMBC’s global mindset. The core of understanding the roots of the world’s most pressing problems begins with conversations between people with different perspectives. When research crosses international boundaries, the sky’s the limit. Tim Nohe, professor of visual arts and director of the Center for Innovation, Research, and Creativity in the Arts (CIRCA), embraces international research opportunities. In 2016, he shared ten years of his research on globalization in Botany Bay, Australia, which he completed as a Fulbright Senior Scholar fellow. This semester, via CIRCA, he hosted a visiting scholar from Nanyang Technological University School of Art, Design, and Media, and connected her with assistant professor of linguistics and French Renée Lambert-Brétière. The College of Arts, Humanities, and Social Sciences (CAHSS) houses many departments and programs that help students develop an interdisciplinary way of understanding based on human and social theories about world economies, internationalization, global education, global environmental changes, communication, culture, and art methodologies. The Modern Languages, Linguistics, and Intercultural Communication (MLLI) department, which offers classes in 11 languages, helps students understand language in a culturally appropriate context for work and play. It also is the center of graduate studies for students who are combining language work with issues of media, communication, education, and diversity, including through the language, literacy, and culture graduate program. Retrievers wanting a daily immersion experience to prepare for future opportunities can be found sharpening their intercultural skills with their peers and native language resident mentors as residents in the Intercultural Living Exchange. “I was a graduate student in MLLI. Both my graduate programs had many international students. The department was all about studying cultures all around the globe,” shares Romy Hübler ’09, modern languages and linguistics, M.A. ’11, intercultural communication, Ph.D. ’15, language, literacy, and culture. Hübler is a native of Germany who now serves as assistant director of the UMBC Center for Democracy and Civic Life. 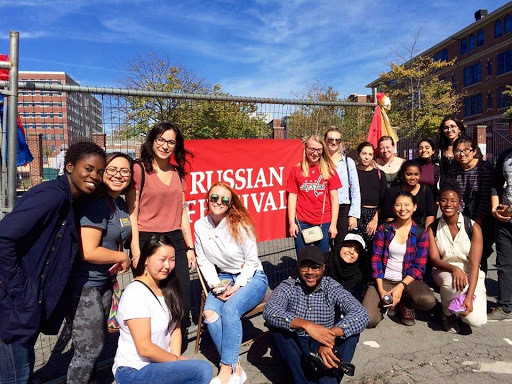 A field trip to Baltimore’s Russian Festival. Attention to international viewpoints drives the Global Studies program, an interdisciplinary major focusing on issues of internationalization in the political, social, cultural, and economic realms, both locally and in the world. Students from majors of all types are part of this program. Felipe Filomeno, assistant professor of political science and global studies, came from Brazil and has made UMBC his second home. In his Approaches to Globalization class, students engage in critical questions about personal, local, and national identity and how civic engagement can help influence government policies and create more cosmopolitan communities. Last fall he took a class to the Russian Festival hosted by the Holy Trinity Russian Orthodox Church in East Baltimore, and his students also produced the Baltimore Intercultural Calendar, which, in partnership with the Mayor’s Office, is set to become the official calendar of festivals celebrating global cultures in Baltimore city. Culturally specific programs and departments like ancient studies, Africana studies, and Asian studies, as well as courses in languages such as Arabic also offer students an opportunity to specialize in a unique global community. These options not only respond to the constantly evolving world of academia, but also reflect the cultural makeup of UMBC’s student body. The College of Engineering and Information Systems (COEIT) attracts the majority of UMBC’s international students. It is also home to a Global Engineering course specifically designed to meet the needs of companies with offices around the world looking for employees that have both the technical engineering skills and intercultural intelligence to work with diverse groups. Led by Marc Zupan, associate professor of mechanical engineering, the course began in collaboration with the University of Porto in Portugal and expanded to include La Universidad de Los Andes in Colombia during mechanical engineering professor Chuck Eggleton’s Fulbright experience there. Using video teleconference, teams across three countries developed the intercultural and technical skills to solve global engineering challenges with attention to localized issues. Some students even had the chance to travel to Porto to meet their Portuguese colleagues in person. In the last decade, UMBC has helped 51 Fulbright recipients travel and learn around the world. Pictured: UMBC’s 2018 Fulbright awardees. UMBC’s Grand Challenge Scholars Program, based on the National Academy of Engineering’s Grand Challenges for Engineering, was brought to UMBC by Marie desJardins, former associate dean of COEIT. It is now led by professor of the practice Maria Sanchez, director of Education and Outreach in COEIT. Students from all three UMBC colleges develop an individualized course plan to gain the content knowledge, technical skills, and a team-centered, interdisciplinary approach needed to solve 14 challenges facing the world, such as access to clean water, or an economical solution to solar energy. Faculty in the College of Natural and Mathematical Sciences (CNMS) are also engaged in numerous international collaborations. For example, research by Kevin Omland, professor of biological sciences, looks at the critically endangered Bahama Oriole in close collaboration with the Bahamas National Trust. Through this experience students learn field research skills specific to a unique setting and culture and the importance of international collaboration in scientific research. Application. Application. Application. 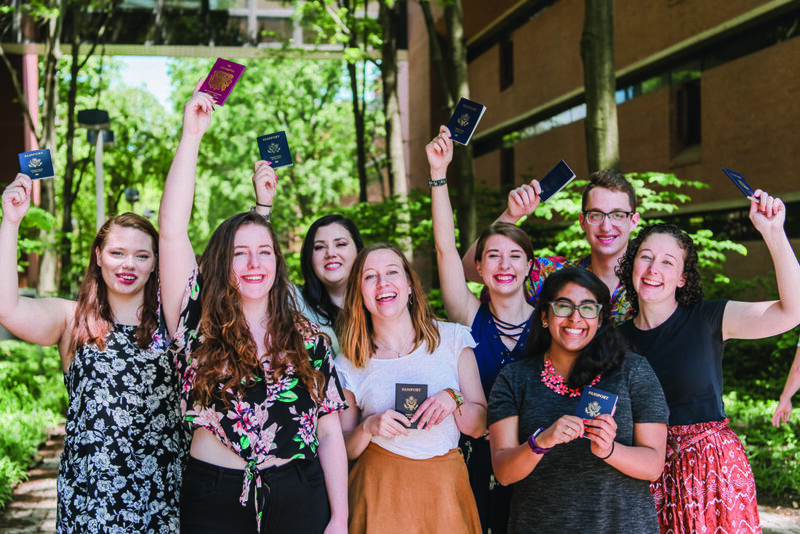 The true test of how much students have learned is when they pack their bags and leave UMBC to study abroad, work abroad in fellowships as teachers, or stay local and engage with international communities. In 1969, the late Walt Sherwin, professor of ancient studies and founding UMBC faculty; Jay Freyman, professor emeritus ancient studies; and Rudy Storch, professor emeritus ancient studies, inaugurated the ancient studies program and the first study abroad program at UMBC, Rome: Ancient and Modern. The popular program continues to this day, engaging travelers in research of ancient civilizations like China, Turkey, Greece, and, next year, England. 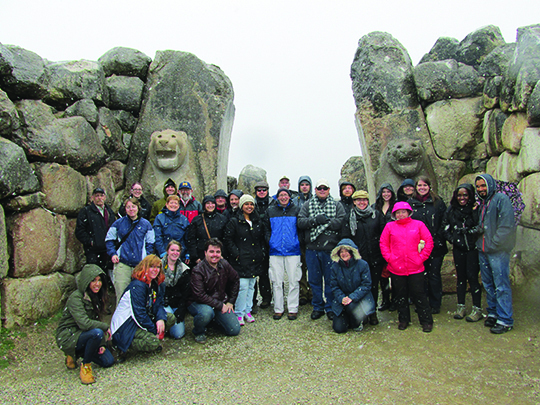 The ANCS Study Tour visits the Lion Gates at the Hittite Capital of Hattusa, Turkey. Today, students have access to affordable, credit-earning, international learning opportunities in 33 countries thanks to the International Education Services Office (IES), which serves as the hub of all inbound and outbound international traffic. It provides individualized support through innovative programming and wrap-around support for: international students accepted to UMBC; students seeking research, study, and teaching opportunities abroad; and faculty-led study abroad courses. It also works with the Fulbright, Gilman, Boren, Critical Language, and Haiyu programs that provide students research opportunities abroad, as well as the You Are Welcome Here program which supports international and refugee students. Faculty are also leading international courses, which have helped students understand Muslim Tunisian immigrants in Sicily, Italian politics, the evolution of the English language in Amsterdam, engineering in Portugal and Colombia, and more — often collaborating with faculty from other countries. Milvia Hernandez, Spanish lecturer and coordinator for Spanish Language Teaching in MLLI, leads a Spanish language immersion course in Colombia at the Instituto de Idiomas, Universidad del Norte in Barranquilla. Global studies majors sign up quickly for this educational experience because of its intensive Spanish language immersion and opportunities to volunteer with local school children and their communities. “Barranquilla is one of the cities Gabriel García Márquez called home. It is Afro-Caribbean, Indigenous, and European, making it an ideal place for living and studying a notably diverse and intercultural population,” explains Hernandez. 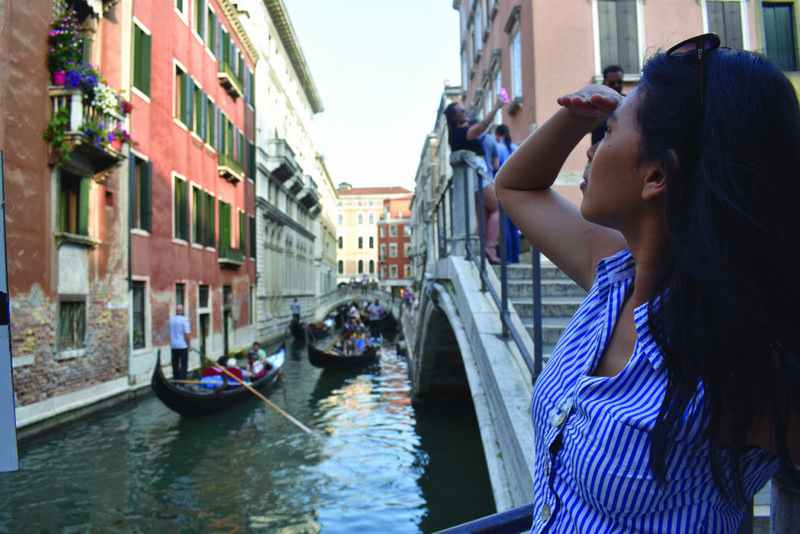 Student Tenzin Yangchen wrote a series of blogs during her trip to Italy. Maggie Holland, associate professor of geography and environmental systems, led a course in sustainable development and conservation in Costa Rica in 2014 that included students from six different study areas. Two years later, Holland reached out to Lee Blaney, associate professor of chemical, biochemical, and environmental engineering, and Matt Fagan, assistant professor of geography and environmental systems, to co-teach an interdisciplinary field class in Costa Rica. The course helps students make the links between water, forests, climate change, and people’s livelihoods (smallholder farmers) in the cloud forest region of Monteverde. Blaney later returned to Costa Rica with the UMBC chapter of Engineers Without Borders to begin a clean water project for a small community. Holland and Blaney are currently on sabbatical in Mozambique and China, respectively, looking for new research opportunities for students. Global engagement is also local. The Shriver Center, UMBC’s portal for service-learning opportunities and internships, offers students opportunities to engage with local immigrant and refugee communities and the organizations that serve them. For instance, through the College JUMP program, UMBC students help 11thand 12th-grade refugees through the college application process. Students can also apply their skills locally through international competitions like the National Association of Schools of Public Affairs and Administration (NASPAA)-Batten Student Simulation Competition. UMBC’s School of Public Policy participated in the competition for the first time last year, completing a global pandemic simulation. Any student interested in current world affairs can apply to be part of the Model UN, or for those ready to test the professional waters, UMBC offers access to GoinGlobal, an international internship search portal. Collaborations with the University of Limpopo and others means new research possibilities. Over the last fifty years, advances in technology have made it possible to forge seamless connections with people in the most remote parts of the world. Advances in travel have created lifelong bonds between researchers, students, and communities around the world. And the willingness to cross borders, collaborate, celebrate, and innovate, reminds us all about the significance of fighting intolerance. Continuous collaboration is at the heart of all international understanding. UMBC is conscious of the importance of a strong commitment to partnerships to work on innovative research and create a network of opportunities for applied learning. Official partnerships that promote student and faculty research opportunities have been established with the University of Porto, Portugal, and University of Kassel, Germany, and three more have been added this past year with The University of Limpopo, South Africa; Universidad de Piura, Peru; and with South Korea. UMBC is now also one of 11 colleges and universities in the nation participating in the American Council on Education’s 16th Internationalization Laboratory cohort. The university will go through a process of developing a multi-year plan to support continued growth in international and global engagement initiatives while also reinforcing our standing as one of the world’s top research universities. David Di Maria, associate vice provost for international education, is thrilled at the future of global commitment at UMBC — and confident that we can help answer the world’s most pressing challenges like climate change, cybersecurity, energy, gender equity, global health, inequality, poverty, sustainable cities, and water.